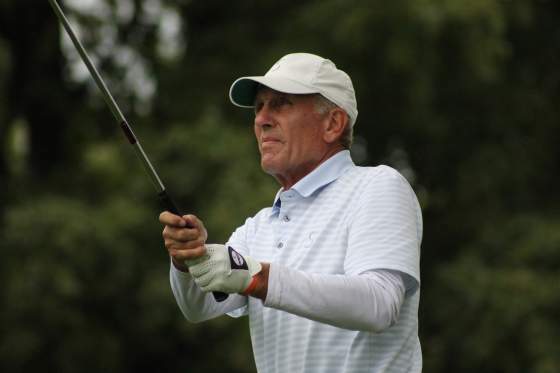 CHARLEVOIX – An emotional local favorite, Tom Rex Jr. of Charlevoix, emerged the champion of the 30th GAM Senior Championship presented by Omni Kinetics Tuesday at what he calls his home course, Belvedere Golf Club. “Words can’t describe what this means to me,” the soon-to-be 64-year-old said after shooting a 1-under 35 and winning by three shots. The field of age 55-and-over golfers played a modified nine-hole set-up for the final round in the rain-shortened championship hampered by heavy rains in the morning that made part of the course unplayable. Rex was tied for the lead with a 2-over 74 through Monday’s wind-whipped round in sunshine, and emerged with a 1-over 109 total after a lengthy rain delay and the final round being shortened to play on the upland holes (holes 1, 7,8,9,10,11,12,17 and 18) of the storied course. He beat Ken Chicka of Shelby Township, who carded a final 37 to go with his first-round 75 for 112. Five golfers tied for third at 113, including Pete Walz and Steve Maddalena of Jackson, Ed Vomastek of Traverse City, Mark Ochsankehl of Grand Rapids and defending champion Mike Tungate of East Lansing. Tom Strand of Traverse City emerged the Super Senior Division champion among the golfers over age 65 in the field. Strand shot a 70 in the first round and closed with a 41 for 111. Ben Benson of Pontiac was second with a 40 for 113. Rex, known in the Charlevoix community for his work with youth in golf and other sports, said he played well with three birdies against two bogeys in the final nine, and said a little luck helped him win. Rex said a little oil was leaking from his game he finished up on the No. 18. Strand, 65, thought he might be in trouble with his 41, but his 70 from the first round gave him enough cushion. The Detroit native who lives in Traverse City six months and Austin, Texas, for six months, was playing in his first GAM event ever, and played Belvedere for the first time in the first round. Belvedere hosted the GAM Senior for the fourth time since 2004, and has also hosted the Michigan Amateur Championship 40 times, most recently 2014 and 2003. From 1963-88 it was the annual host.